Brig. Gen. Carl Schaefer, 412th Test Wing commander, gives opening remarks to 40 military spouses at the Crisis Action Team building March 27, 2017. The training event gave spouses an inside look at emergency operations. With periodic exercises and experiences from real-world events, Edwards Airmen and civilian responders are well-trained on response and recovery procedures during an emergency. However, Airmen and civilian workers are just one part of Team Edwards. 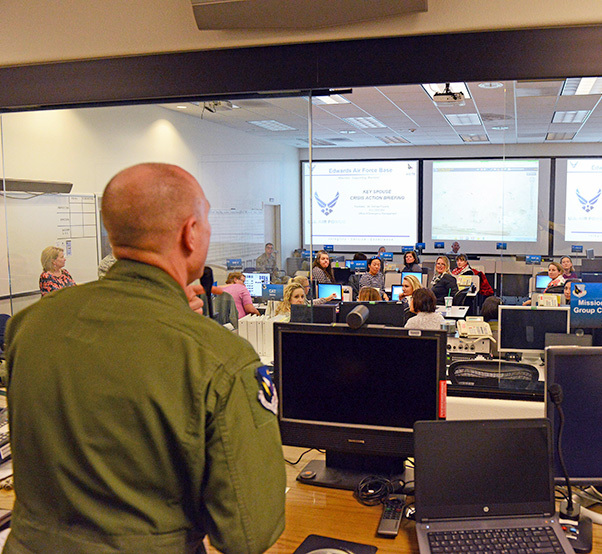 That’s why a special training event was held March 27, 2017, to give 40 spouses an inside look at emergency operations. The training took place at the Crisis Action Team building located by Bldg. 1. The night began with a look back at the timeline of an Edwards T-38 crash in 2009. The presentation showed everything from the time of the crash to when and how a notification team is assembled in the case of a death. This unique training event was the idea of Pauline Schaefer, wife of Brig. 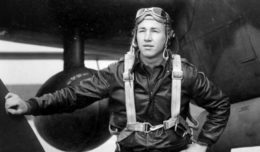 Gen. Carl Schaefer, 412th Test Wing commander. With these conversations, Mrs. Schaefer and General Schaefer decided to put together a one-of-a-kind training that teaches spouses what takes place when the Crisis Action Team is activated. “Thanks to Mrs. Janice Hollen (412th Force Support Squadron director) and Maj. Jane Dunn of the FSS, we were able to facilitate the training and cover everything from notification, mortuary affairs, casualty assistance, chaplain and mental health services, and how to best support a family in crisis,” said Schaefer. Forty military spouses learned about emergency operations at the Crisis Action Team building March 27, 2017. 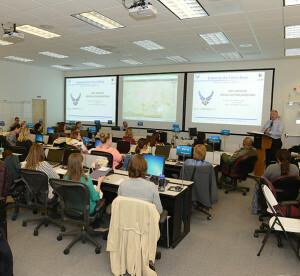 Subject matter experts from the base gave briefings on the various subjects involved throughout an emergency. The spouses were well engaged in the training, bringing up questions and comments about the time it takes to receive an official statement from the base and how social media can be both helpful and harmful in regards to communicating and rumors. “I believe the most challenging thing for base members during an emergency is waiting. Waiting for information, waiting to take action, waiting to hear from our spouse. Most importantly, waiting to post on social medial before we know what is going on. Waiting can be torture,” said Mrs. Schaefer. One item that was heavily emphasized was the importance of Airmen keeping their Virtual Record of Emergency Data (vRED) updated to ensure everything is accurate in the event something tragic may happen. Spouses of other branches of the military in attendance were encouraged to remind their military members to do the same with their respective services. The spouses finished the two-hour training event with a tour of the Edwards Command Post. 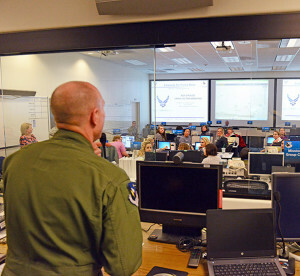 “This type of training has never been offered to spouses at Edwards AFB and I believe the information the training team provided will equip spouses to better support future families in crisis,” Mrs. Schaefer said. To read more about vRED, click here: http://www.af.mil/News/ArticleDisplay/tabid/223/Article/486040/airmen-encouraged-to-review-vred.aspx.